The Andrews Labor Government has marked its first year in office by announcing the removal of four more level crossings, including Abbotts Road in Dandenong South and Thompsons Road in Lyndhurst. 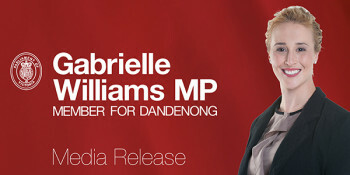 Dandenong MP, Gabrielle Williams this week called on the Minister for Women and the Prevention of Family Violence to join her to host a family violence forum in Dandenong. The Andrews Labor Government today released a snapshot of feedback from the first round of community consultation on the removal of nine level crossings on the Dandenong Rail corridor – Melbourne’s busiest. More than 200,000 motorists will experience a safer and more reliable drive with a $400 million upgrade to the Monash Freeway. The Andrews Labor Government has placed the order for 20 extra E-Class trams, securing hundreds of jobs in Dandenong. The shortlist of bidders to build Melbourne’s new fleet of 37 new high capacity trains has been revealed and it includes local Dandenong-based train manufacturer Bombardier. Member for Dandenong Gabrielle Williams said the 16-day Victoria Against Violence campaign, beginning 25 November this year, will highlight the devastating impact of family violence across Dandenong and the state. The Andrews Labor Government is joining forces with Cricket Victoria and Cricket Australia to help the state build on its status as the cricket capital of Australia.